Erica Wilson, who passed away this past December, is an icon of the needlework world. In the early 70’s, she starred in a TV show on PBS dedicated to needlework. 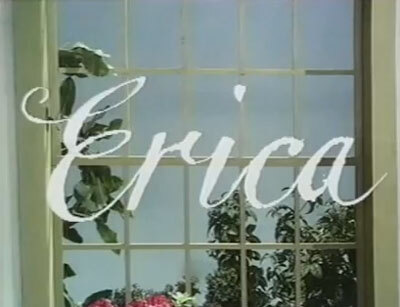 The show was called Erica, and as it was a teeny bit before my time, I can’t say I ever watched it. I’d love to see the show available as a DVD set – wouldn’t that be fantastic? If you want to see Erica Wilson’s needlework show these days, you have to resort to the next best thing: some of the clips are available on YouTube now, thanks to Erica Wilson Nantucket, her Nantucket-based shop. So far, six clips from Erica Wilson’s needlework show have been uploaded to YouTube. They include Embroidery in Gold Thread, Shisha or Mirror Work Embroidery, Crewel Point, Erica Wilson Stitches an Owl (from the episode Thinking Bigger), Thinking Big with Erica Wilson, and Bargello Needlework. I’m hoping more will be added soon, and I thought it worthwhile to subscribe to Erica Wilson Nantucket (where you can find all the videos conveniently listed) on YouTube, just to keep an eye out for more. You might want to do the same thing – if the numbers are high enough, who knows? They might see the interest as a good reason to release more shows. 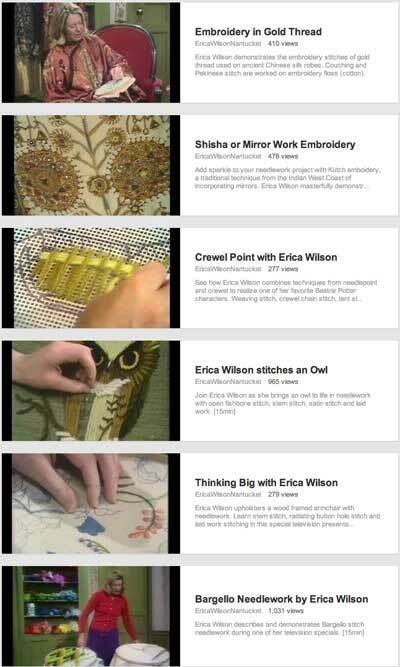 In the video titled Erica Wilson Stitches an Owl (from the episode Thinking Bigger), you can pick up some terrific embroidery tips. For example, at about 5:08 into the video, she explains how to transfer a large scale design on dark nubby fabric using tulle netting and a permanent marker. 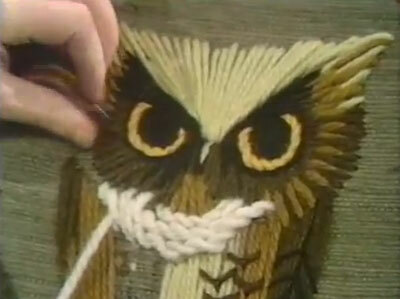 As she works the owl, you’ll pick up wonderful stitching advice that can be applied to all kinds of embroidery. For example, as she’s stitching in some of the feathers, and she’s talking about picking out stitches that don’t look right, she asserts, “You don’t always have to even take it out. You can sort of cover over some of your stitches, rather as you do when you’re oil painting.” I love her! All of the videos are worth watching and are loads of fun! So… grab a cup of tea and sit down with Erica Wilson on YouTube. If you’re like me, by the time you finish the six videos posted so far, you’re going to be clamoring for more! Thank you, Mary! I didn’t know about this. Great stuff! I have now subscribed, too. I did watch Erica occasionally back then. Merci pour ces videos. Je vous lis chaque jour, mais difficile de parler anglais, j’ai bcp oublié. Thank you for videos. I read all days your news, but it difficult for me to speak english. I have so much forgotten!. Thanks a bunch for this post! It has cheered me up :-). Must check those videos soon. About the 1st quote… it cracked me up, So true :-D!!! I learned to embroider from my Grandmother, but Erica Wilson was the first person to show me that there was Art in stitching. I stumbled across one of her books in the library, and fell in love. I haven’t ever seen any of the videos, and I look forward to watching them. i definately knew of erica wilson in the 70’s as i had quite a few of her books already. at the time i did not know she had a show on pbs. i learned that later. in the 70’s i loved her designs but i have become much more conservative over time though i still have her books. she had wonderful technique, and she was fun to read. i can’t wait to watch these videos. thanks for the heads up mary. Thank you so much for letting all of us know about these! It’s just the boost I needed after a 90 minute embroidery class with 8 and 9 year olds who couldn’t keep their needles threaded today! I alreadyhave the tea and am now going to go watch one of the videos. This is great. I subscribed too, would love to see more. I like her approach, your right there in the room and she’s talking to you, not at you. Thanks. I was sorry to hear that Erica passed away. About ten years ago I was living outside of Manhattan and spent a wonderful afternoon adding to my stash of Appleton wool and buying a wonderful crewel pillow kit (which still adorns my bed) in her shop on Madison Avenue. I own many of her books as part of my ever expanding library of stitchery books. Thanks for the links and I will add my voice to youTube. I watched the shisha embroidery clip — it was so very clear, I could easily do it without further reference. Also, I enjoyed seeing the oh-so-70s examples she showed. Thanks, Mary, for this wonderful tip. Mary..I took your suggestion and watched Erica Wilsons videos. Erica said it is a “no no” to turn your embroidery to the back. Can you explain how she fastened her thread? It’s not so much a case of its being an absolute rule not to turn the work over. Often, we have to turn the work over for one reason or another – including anchoring threads. But for the most part, it saves time (and often avoids exertion, especially if working on a very large frame) not to have to flip the frame. Instead, the threads are anchored from the front, either using a waste knot that is cut after the connecting thread between the knot and the start of stitching is thoroughly covered by ensuing stitches, or by using tiny stab stitches in an area close to the starting point, and cutting the knot. The stab stitches are then covered by the embroidery. If you look under Tips & Techniques, you’ll find a section of posts detailing different ways to start and end threads. Also, on many photos of the Medallion project that I’m working on right now, you’ll see tiny specks of stitches that often prompt people to ask the same question: what are all those little stitches? Those are the anchor stitches, and eventually, they are completely covered. So that’s what she’s taking about, and I don’t think, in context, she’s setting it down as an absolute rule to never flip the frame, but saying kind of tongue-in-cheek how we wouldn’t want to have to go to the effort of flipping the frame… It’s just easier not to, it saves time, it avoids exertion when working with a large frame and, above everything, it avoids a knot on the fabric while perfectly securing the thread. I just watched all of them except the bargello one. They are wonderful. She was so clear and so enthusiastic. Thanks for sharing them. For some reason the bargello video isn’t working. Mary, thank you for posting such wonderful articles, photos and links. I look forward to seeing the surprises you have in store for us. I have been embroidering since the age of five (my mother stressed the necessity of embroidery). Though I don’t do as much hand embroidery these days. Oh, that brings back memories of when my mom taught me bargello…and I love it! I also love the “…we must finish our Bargello” line! Thanks, Mary. Thanks for sharing this Mary! Always learn something from you when I drop in. Hi! I am in the UK & have also tried to view the Bargello video. It comes up marked “This video is private”. It is the one I particularly wanted to see! Do you know why this, of all the ones available, cannot be viewed & whether it will be made public again? I just found a copy of Erica Wilson’s Crewel Embroidery at an antique mall — I don’t stop at them often, maybe once every year or two. I was looking for books in sad shape to decoupage with and there she was, in pretty good shape! I’m happy to have a well-recommended reference — thanks! I really want to see Erica Wilson’s bargello video, but that one is marked as private, so I can’t access it. I well remember the comment about the kids murdering each other etc, and can still see my father bristling at the idea of a woman neglecting her proper duties! I was not aware that she had died, what a loss to the art. I watched her programs on PBS faithfully through the years and was rewarded by much inspiration. She had done such beautiful work. I too would love to see her programs put to disc. How fortunate we were in the ’70s to share her expertise. I made that large wall hanging with the birds and textured tree trunks. Now, my twin sister it making for her home in Vermont. It was a fun project that moved along very fast. Thanks for sharing the link.